REALITY # 2: CAN LIFE SKIRT THE UNCERTAINTY PRINCIPLE AND THE SECOND LAW OF THERMODYNAMICS? THE TAKE HOME: IS THE UNCERTAINITY PRICIPLE EQUIVALENT TO THE SECOND LAW OF THERMODYNAMICS? I’ve written extensively about this subject and about Maxwell demons and the curious case of the linkage of Heisenberg’s uncertainity principle to the second law of thermodynamics. My belief is that all topologic insulators, especially the one buried in mitochondria, are very tiny Maxwell demons that can skirt the second law of thermodynamics by making the ledge of that larger in ways we do not observe. This occurs because of the scale of the changes that increase this energy ledge are mush smaller than the macroscopic objects that human can process with their senses. Recently physicists are now beginning to realize that small quantum systems do not act like a cup of hot cup of coffee or a star in space. Two recent studies are now aligning with many of the things I teach my members. The second recent study in H-theorem was written that also supports my beliefs. Hyperlink. The second law of thermodynamics was really brought to prominence by Ludwig Boltzman in the 1870’s. Boltzmann published his celebrated kinetic equation and the H-theorem that gave man the statistical foundation of the second law of thermodynamics. On his grave stone in Zentralfriedhof, Vienna is carved S = k (x) log W. This simple equation describes entropy or disorder of a system. S is the randomness or entropy, W describes the various ways of arranging the atoms in the system, and k is a fixed number now known as the Boltzman constant. When you look at his equation as a biologist, it becomes apparent the arrangment of the atoms in cells is the critcal determinant of how life does what it does. The physics of organisms are the key to the understanding biology. This equation shows that the second law of thermodynamics that deals with heat transfers appears to always hold and be axiomatic. This is true in closed system and those at equillibrium, but it does not apply to open systems or to systems built to be far from equilibrium. All living cells are open systems built far from equillibrium. Sir Alfred Eddington, the famous astronomer who proved that Einstein’s theory of relativity was true , said that any theory that is found to contravene the second law of thermodynamics has no hope of being true in 1915. This belief hold until today. The problem with this idea is that life has apeared to skirt the second law of thermodynamics by physicists since the second law was penned. Physicists, without saying it aloud, have said if there is a God, the deity certainly must be a thermodynamicist. 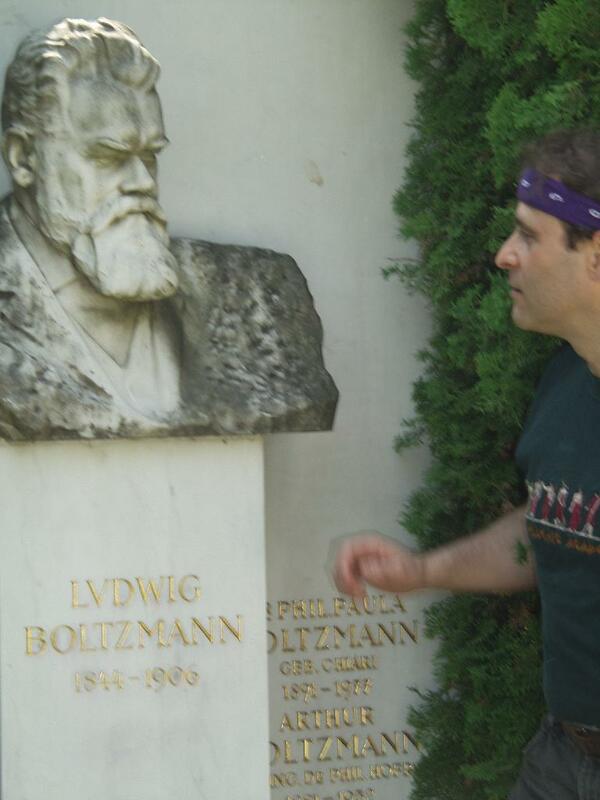 100 years after Boltzman death, Vlatjo Vedral anaylzed Heisenberg’s uncertainty principle at the basis of quantum theory, and found that the Boltzman’s law is essentially another mathematical way of explaining the Boltzman law of thermodynamics. The “uncertainity principle” fundamentally tells us how much information can be extracted from a physical system. This means that the uncertainity principle and the second law of thermodynamics both must link to information theory directly. Biology is solely based upon putting these two equations to work in hydrated proteins. If one studies proteins sans the water, the results will not be equivalent. The study of regular biochemistry in most books is based upon the subtraction of water to study the proteins in isolation. In science today, this bio-chemical paradigm is being replaced by the new scicnce of topology. In October of 2016, the Nobel Prize for physics was given for the science of topology. Molecular biology is really the study of the physics of organisms and how cell organization puts quantum weirdness to work to build life. Most people are not aware that the basis of the entire food web on earth is due to photosynthesis. Let us examine why this is so critical to get wellness right. All food is a light story at its foundation because of the “Rubisco enzyme” at the core of photosynthesis. The secret nature employs in planning for the future invasion of food to the Earth surface was like all projects that initially seem overwhelmingly complex complex and difficult. Nature broke up all the steps into deft smaller tasks, trillions of them in reality in plants. This principle of organization in nature is ubiquitous and applies at all scales of nature. If you have any big task, and you want to get it done, just breaks it up into smaller packets or chunks. Make sure the chunks of information and data are meaningful, implementable, and doable packets using nature’s laws and success will follow. This idea makes time management of any task much easier when you think about it. In the macrosciopic world we need quality assurance programs in place to make sure each step is done properly. In the quantum world we do not need any such program because each packet/chunk is a quanta of energy. Since the chuncks are pre-packaged and precise cells do not need to worry about the process breaking down. Mother Nature’s laws do not falter, so organizing time for cells really is all about the clock mechanism and not the actual work done by energy at each step. This makes it ridiculously precise and efficient. 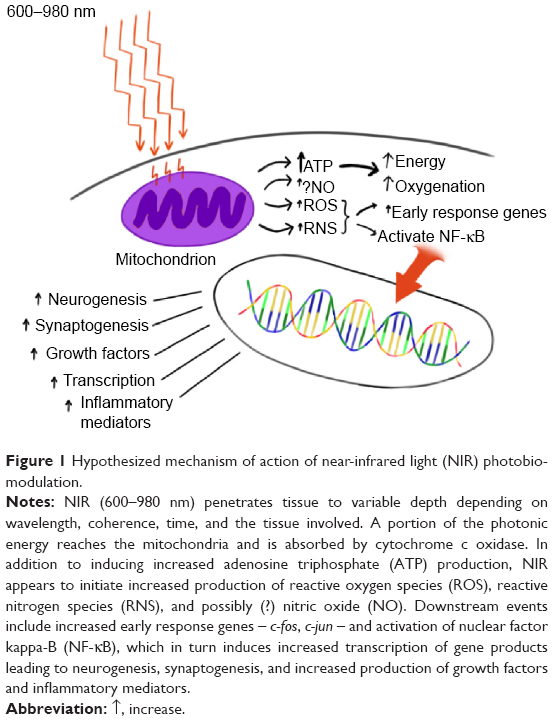 This is likely why every gene has a molecular clock in front of it, that is ultimately controlled by one central clock that begins in our eye where light interacts with melanopsin and retinol coupling. Why? You only need to manage time to get the single packet/chunk done correctly when atoms are organized this way. When you get success with one packet/chunk it is reenforced because their you build a “molecular satisifaction” or probability that completion will happen. Recall that nature works exclusively on probabilities of things occuring. This mechanism happens in a leaf and in our brains. The more success we have on the timing of small quanta of information in the brain the more neurochemical satisfaction occurs at the completion of each stage. So how does “molecular satisfaction” correlate to the creation of a very complex food web using light frequencies as the quanta/packets/chunks of data? The leaf is where chlorophyll and chloroplast are located. Chloroplast, like mitochondria were derived from bacteria in an endosymbiosis that occured in plant cells about 30-50 million years before it happened in animals cells to make the mitochondria. This is why the Rubisco protein is the basis of all life on Earth. The leaf’s chloroplast is the most remarkable technology nature has ever built. It uses topology and excitons to get the job of life done. Sunlight lands on the surface of a leaf in quantized packets of energy we call light photons. Every second a leaf spends in bright sunlight, the leaf gains trillions of photons. The photons come in all colors or frequencies because the sun’s light varies by location altitude and time of day. 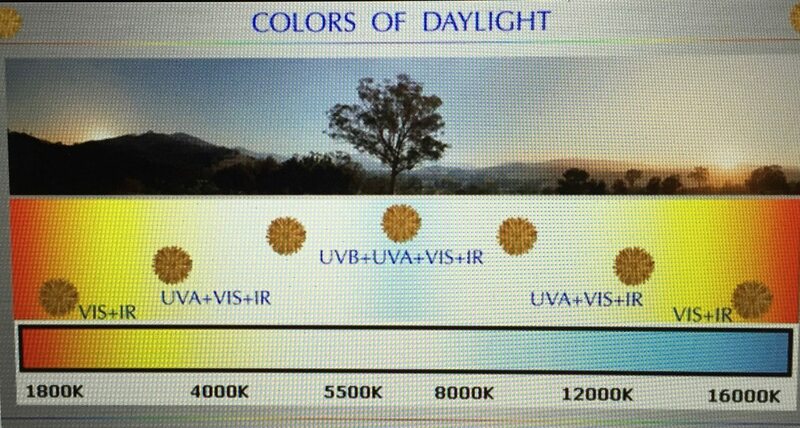 For example, the AM sunrise color temperature is 1800K while the sunset is 16,000K. Both contain visible and infrra red sunlight. But the color temperature of solar light varies tremendously from sun rise to sunset. This is tied to the blue light present within the light. For example, at my 28 latitude in winter time we have only 13% blue light in our light but in summer time it rises to 26%. This has huge implications on the types of foods than can and cannot grow at times of the year. That light signal must be coherent via the skin in eye to register properply in the gut and mitochondria. Color temperatures over 5000 K are called “cool colors” by indoor lighting convention, and are bluish white, while lower color temperatures (2700–3000 K) are called warm colors which are yellowish white through red. Many people are confused by the use of “K” or Kelvins and not the use of centigrade or Farenheit. The color temperature of the electromagnetic radiation emitted from an ideal black body, like the sun, is defined as its surface temperature in Kelvin, or alternatively in mireds, which is a micro-reciprocal degrees (Kelvin). This permits the definition of a standard by which light sources are compared by the lighting industry to natural sunlight. The Sun closely approximates a black-body radiator. The effective temperature, defined by the total radiative power per square unit, is about 5780 K. The color temperature of sunlight above the atmosphere is about 5900 K. This is usually the color temperature of sunlight at solar noon and not all day. Solar variation is important to cells. As the Sun crosses the sky, it may appear to be red, orange, yellow or white depending on its position in the sky. This varies by altitude and latitude. I believe the major variation today is now effected by population density as well. The changing color of the Sun over the course of the day is mainly a result of scattering of light in our atmosphere and is not due to changes in black-body radiation. The blue color of the sky is caused by Rayleigh scattering of the sunlight from the atmosphere, which tends to scatter blue light more than red light. The reason is simple. Scattering of light is inversely proportional to the 4th root of the wavelength of light. 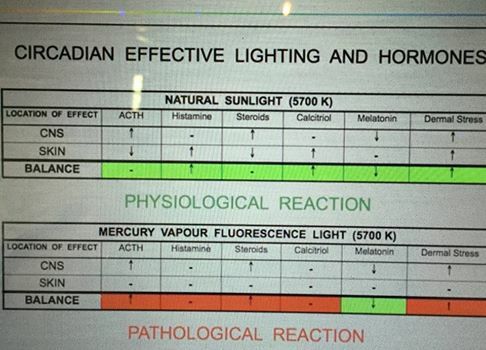 Since blue light has more power than red light, it scatters most and this is why the sky is blue on Earth. Blue light also bends more than any other frequency that enters the anterior chamber of the eye, so this cause a blue light aberration. It means that blue light is focused anterior to the retina in the eye BY DESIGN. This is why the melanopsin receptor and a large amount of retinol are in these areas of the retina. 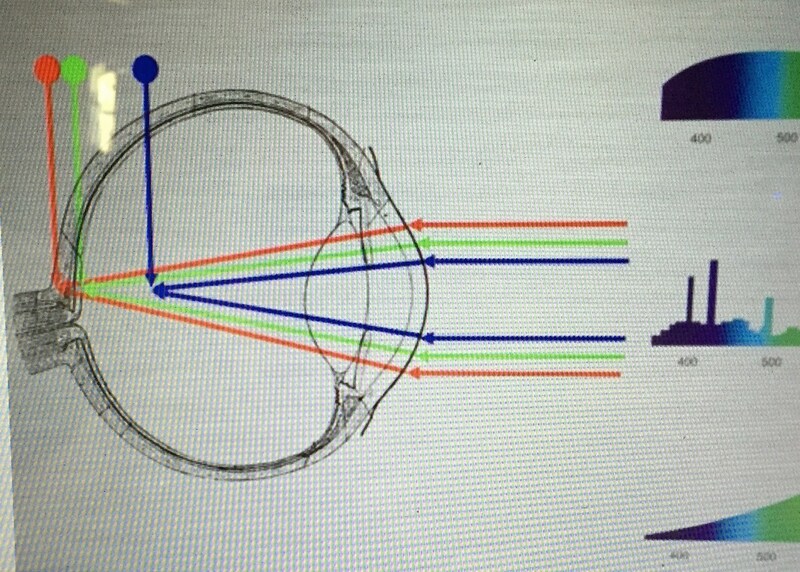 They form the non image portion of vision known here as the “eye clock” mechanism. 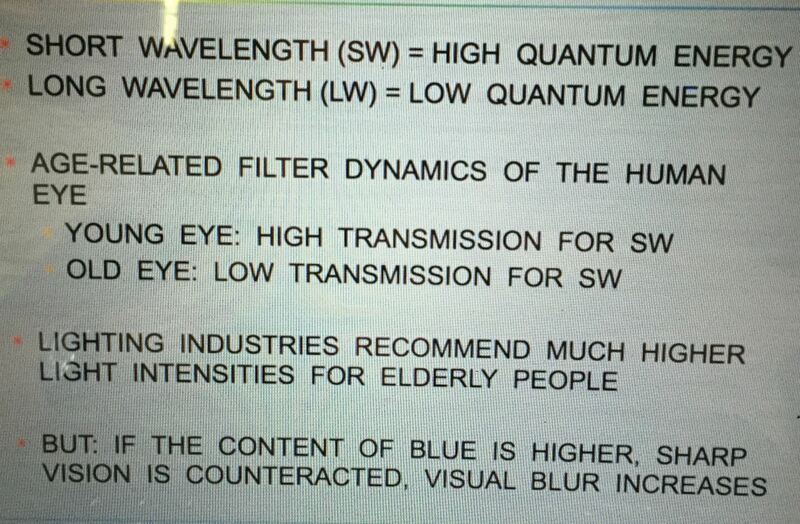 This is why excessive blue light causes blurred vision acutely, and if it is chronic it will elongate the globe to cause myopia and many other disease related to thinning of the retina. Some early morning and evening light (golden hours) has a lower color temperature due to increased low-wavelength light scattering by the Tyndall effect. This effect is especially pronounced with the increase in small dust particles in the atmosphere after the eruptions of Mount Tambora in 1815 and Krakatoa in 1883, which gave rise to intense red sunsets around the world. This finding also gives us a clue that around the KT- event 65 million years ago, any sunlight that pentrated the atmosphere’s particle also likely gave rise to red light and a lower color temperature. This may explain why the animals who survived the KT event all had a high mitochondrial capacity. Mitochondria favor red light chromophores or antenna’s for red light. 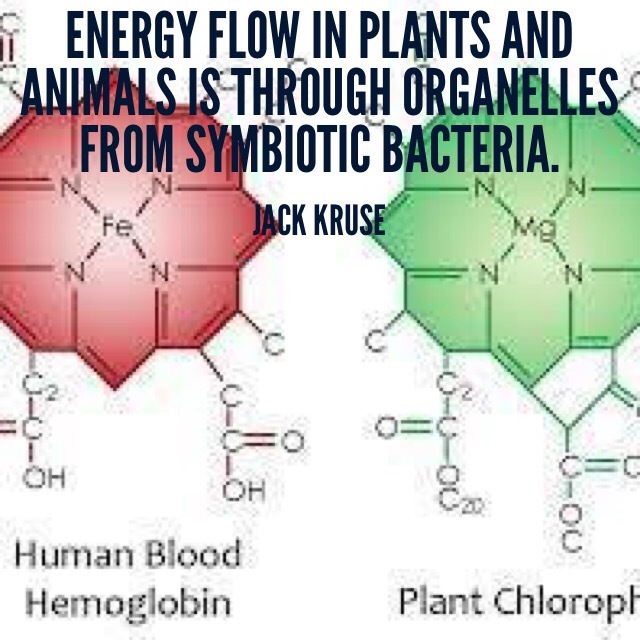 Cytochrome c oxidase, the Q-cycle, and the ATPase are all specialized red light antenna’s, we call chromophores, because they have heme like proteins in their mitochondria and used hemoglobin to assimilate sunlight into their blood plasma. When visual blur occurs it elongates the eye to cause myopia and leads to cataracts, macular degeneration, and aging increases in mitochondria because blue light destroys the central retinal pathways of melanopsin that link to melatonin. Melatonin controls all mitochondrial DNA transcription in tissues hence why altered melatonin leads to diseases of aging via mitochondrial heteroplasmy rates. Almost every photon of sunlight that is red, is captured by leaf’s chloroplasts. This tells us the system likely was optimized to red frequencies as well, because of the environmental thermodynamic givens tied to the frequencies of our sun’s light. 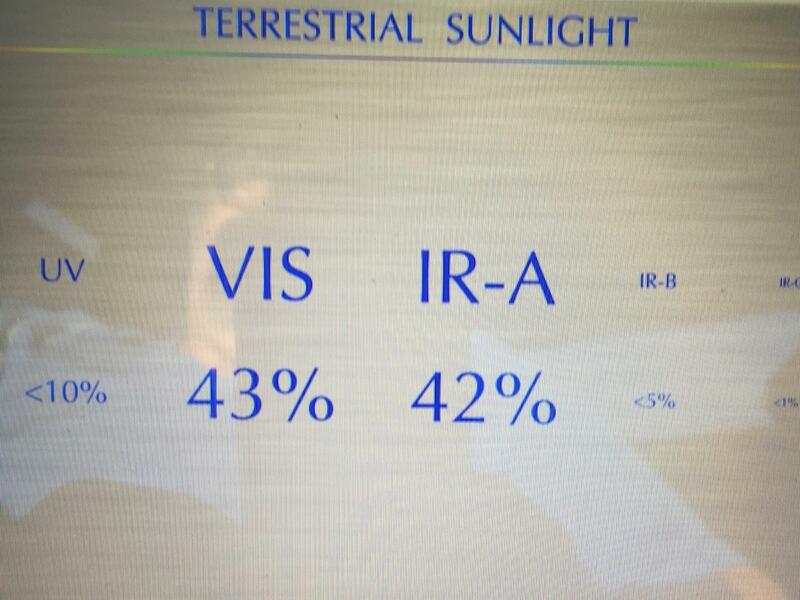 It turns out 42% of the light that falls to Earth is in the IR- A frequency light. It appears when particulate matter is present in the atmosphere red light is still the favored frequency of things alive below on Earth. When light strikes an electron in a leaf the first stop the electron exciton makes is the antenna. This is an assembly of hundreds of thousands of chlorophyll molecules. When the chlorophyll is hit by the photon, one electron within chlorophyl becomes excited, it forms an exciton and it uses this energy to bounce through the antenna to the bridgeing area. This region is composed of a complicated arrangement of more chlorophyll molecules. Its like an area of of intertwined mazes of rope bridges that, if you can find the path through, will lead to the most important area, called the reaction center. Once the exciton is at the reaction center, the exciton electron creates a permanently separated charge that can be stored by the leaf in water. This stored energy is like a battery or capacitor. In leafs, that energy is stored in water and can be used later to do physiologic work of photosynthesis. There is one “quantum catch” in this process. The reaction center is nearly impossible destination to get to on time!!!! If it does not get there on time the energy stored is lost as heat. We call this thermalized loss to the environment. The exciton only has about 1 nanosecond to get across the chlorophyll bridges before heat is lost in the system. So how does a leaf circumvent this maze? It uses “quantum weirdness” to circumvent time using excitons. In this way chlorophyll makes excitons to increase the ledge of the second law of thermodynamics. Excitons are particles that don’t really ever exist in the classical sense of human understanding, and because of this, excitons never experience time as we do. Because excitons do not experience time, the path to the reaction center is very easy to decipher before the sun’s energy is lost as heat. Gregory Scholes is a botanist who wrote a 2010 paper in Nature that shocked the world. When he removed the photosynthetic centers in leaves and shined laser light on them his experiments showed that leaves accomplish their goal by allowing the absorbed energy from the sun in the leaf to reside in two different places at once. This quantum process has a name. It is called quantum superposition. It turns out RBC’s, the blood plasma, and the Q-cycle in mitochondria use the exact same process used in leaves to circumvent time in our mitochondrial respiratory proteins. So, what aspect of quantum mechanics allows this effect to occur? Quantum superposition appears bizarre and counterintuitive to our common sense, but its scribed into quantum mechanics of how reality is built. The mathematics describes the position of the exciton only in terms of the “probabilities” of finding it in various different places. The uncertainty principle and the second law of thermodynamics do exactly the same thing using statistical mechanics as their guide. This means that both laws, are saying the exact same things, using different semantics, to get their point across. It turns out in a leaf, under certain circumstances, an exciton from chlorophyll can occupy multiple positions at once in reality to transform sunlight into the entire food web on EARTH! I think people forget that chloroplasts and mitochondria both were stolen bacteria at one point in life’s journey. When you realize this it makes sense why both would use the “exciton mechanism” to allow energy flow from the sun to cells in wireless fashion. It also turns out that the remarkable efficiency of photosynthesis in algae where DHA first appeared 650 million years ago, and their evolutionary descendants plants, also deploy quantum superposition so that energy can simultaneously travel along all possible paths of the bridging maze of chlorophyll to reach the reaction center. In fact, experiments have now shown that the exciton always gets to the reaction center before time expires. In otherwords, it never fails in experiment. This is why it is a basic LAW of nature and quantum mechanics. Excitons can explore all paths to the reaction center, simultaneously, without any time delay ever occurring. This trick has also been found in bacteria like Chlorobium tedium. Science knows bacteria where here before plants and eukaryotes. It appears this quantum trick has been used by life from genesis 3.8 billion years ago. It is so exciting because it clearly has now raised the spectre to modern cell biologists that animals, like humans, also can use the very same process in many cell systems. Biology has yet to realize this, but the new field of quantum biology has found much evidence for the effects in many skin and blood systems. I believe this process occurs in the skin’s melanin and eumelanin. It also happens in carotenoids and in the cells suspended in blood. Once the excitons are collected by these reaction centers the energy is transfered to water where protons tunneling transfers the signal at the speed of light to mitochondria at cytochrome 1. Here it enters the Q-cycle to affect cytochrome c and the ATPase which are both red light chromophores and both tied to ATP production. Water is also a red light chromophore. I believe the phosphorus in our skin, proteins, and blood cells is critical to charge separating water into protons cables to transfer the energy and information from our surfaces to the mitochondria below. This process occurs just as it does in leaves. The difference is the distance and reaction center in animal cells are the Q-cycle and the the last two cytochromes. Modern technology’s semiconductors have not yet figured out yet how to do what plants or animals do in solar panels. Solar photo electric conversion has a poor efficiency and the reason is simple. 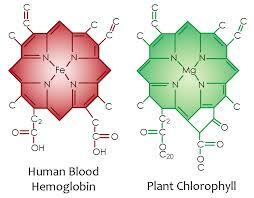 Humans have not designed a chlorophyll, hemoglobin, DHA like molecule that can do what cells can do. Technology is a slave to time while cells are not. The current generation of photovoltaic panels only converts 20% of light falling into them. The use of graphene is likely going to improve this situation. If you have a lot of money there is new technology that boost the efficiency now to 35-40% but it will cost you 100,000 per square meter to get it. The current efficiency in a plant’s leaves is between 90-99% depending upon season, incident light, and water content of the leaves. I do want you to understand that this super efficiency in plants is not converting 90% of light power into stored chemical energy. Only 5% of the energy is stored in chemical bonds, the rest is buried in water to build a strong exclusion zone in the leaf. Water is critical to the quantum efficiency of photosynthesis. This stored energy in water is the basis of life on Earth, because photosynthesis is basis of the entire food web and it is 100% linked to quantum weirdness. Erwin Schrodinger told us in his 1944 book that life seemed somehow to break the second law of thermodynamics. This flummoxed him, because he also said, despite life’s uncertainty, life is clearly stable or it could not exist. That is reality. Understanding reality means we have to accept “holes in reality” that things like excitons create. Life is capable of reproducing offspring who are stable and they appear to transmit their moving subatomic particles in a reliable way to create a functional offspring. In this sense, life appears to skirt the second law by using the subatomic wierdness in leafs and mitochondrial to create a perpetual motion machine for electrons and protons and it all driven by incident sunlight. He also remarked in his book that in order for life to maintain its stability and sustain the living state without throwing its future into chaos it had to control the flow of heat from hot to cold and cold to hot by being much larger than its constituent parts of atoms and subatomic parts. Life has to be built on a scale that would hide all these weird quantum effects, using the Quantum Zeno effect of our 5 main sensory receptors that feed data from environmental waves to our thalamus. Schrodinger was fascinated by the size of the first gene extracted from fruit fly’s in the 1940’s. He guessed that a gene would be have to larger than biologists expected in the 1940’s to bury the quantum effects. The biologists who found the fruit fly’s gene’s found them to contain only a couple of hundred of atoms in diameter and later those genes would be found not exceed a few million atoms in length. Schrodinger was right in his guess, but wrong in his reasoning. He knew that cells had to much bigger than the genes that controlled them to work on large enough scales to avoid the downsides of quantum theory. However, it never occured to him, before he died, that the upside of quantum weirdness might actually be quite useful to life. Photons hit semiconductive proteins to make “holes in reality” that create life using the most counterintuitive parts of quantum theory. (1) Gregory D. Scholes, Graham R. Fleming, Alexandra Olaya-Castro and Rienk van Grondelle, “Lessons from nature about solar light harvesting.” Nature Chem., 2011, 3, 763–774. (2) Jessica M. Anna, Gregory D. Scholes, and Rienk van Grondelle “A Little Coherence in Photosynthetic Light Harvesting.” Bioscience, 2014, 64, 14–25. (3) Francesca Fassioli, Rayomond Dinshaw, Paul C. Arpin, and Gregory D. Scholes “Photosynthetic light harvesting: Excitons and coherence.” Royal Society: Interface, 2014, 11, 20130901. (4) Gregory D. Scholes and Edward H. Sargent “Boosting Plant Biology.” Nature Mater., 2014, 13, 329–331. (5) Elisabetta Collini, Cathy Y. Wong, Krystyna E. Wilk, Paul M. G. Curmi, Paul Brumer, and Gregory D. Scholes, “Coherently wired light-harvesting in photosynthetic marine algae at ambient temperature.” Nature, 2010, 463, 644–648. (6)Scientific Reports. 2016. H-theorem in quantum physics G.B. Lesovik, A.V.Lebedev, I.A.Sadovskyy, M.V. Suslov & V.M. Vinoku. (7) Chanelle C. Jumper and Gregory D. Scholes “Life—Warm, wet and noisy? Comment on “Consciousness in the Universe: A Review of the ‘Orch OR’ Theory” by Hameroff and Penrose.” J. Physics of Life Reviews, 2014, 11, 85–86 .